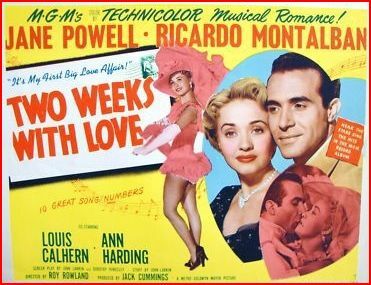 This 1950 MGM frolic is probably my favorite Jane Powell movie…and that is a hard choice for me to make. Jane plays Patti Robinson, a young woman ready to take the leap to adulthood, but her loving-yet-traditional parents are holding her back. Her family is set to take their annual vacation to “Kissimee in the Catskills”, a storybook family resort. Patti, who normally loves taking this trip, is desolate at the thought of seeing her slightly more mature friends (who will surely be wearing corsets by now). Patti’s mother refuses to let her lengthen her skirts and tighten her waist…so she is doomed to spend another summer in her baggy girlish frocks. Not helping the situation is her precocious and very outspoken sister, Melba (played by a very young Debbie Reynolds, in a role that shows exactly why she became a star). As if Patti wasn’t distraught enough, in walks Demi Armendez (Montalban), impossibly handsome and successful and the apple of every female eye. Patti immediately develops a huge crush on Demi, and also immediately begins to embarrass herself every time she encounters him. Patti is soon in competition for Demi’s attention with her much more sophisticated friend, Valerie (Phyllis Kirk). If only Patti could get herself a corset, she could definitely win Demi’s affection, right? That’s one of the many questions answered in this movie, and along the way there are several wonderful songs and laugh-out-loud predicaments. This movie, for me, ranks among the likes of Meet Me in St. Louis and In The Good Ole Summertime. It’s bright and fun and definitely worth your time.